It is going to cool off in Tennessee this weekend and you need something to keep you warm. 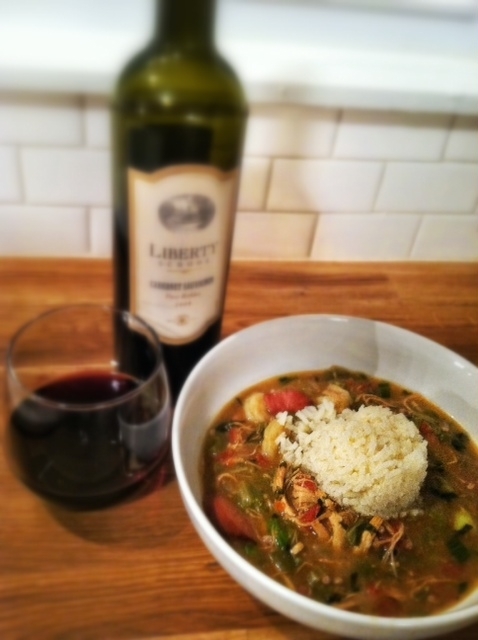 If you find yourself with a little time on your hands then this gumbo is for you. It takes about 3 hours from start to finish but there is lots of down time in between steps. It’s a good game day recipe. Or a good recipe to make when you HAVE to be at home because you are say, auto cleaning your oven or something exciting like that. 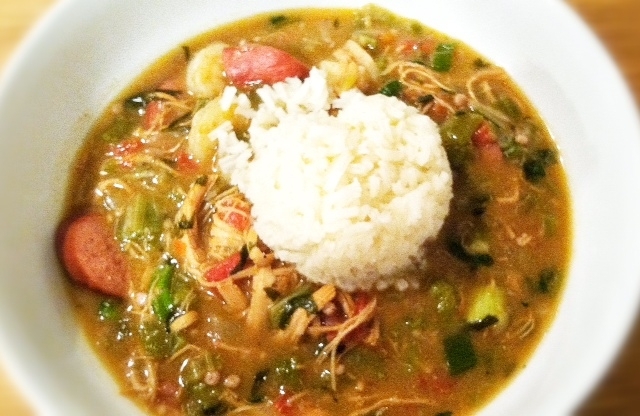 Gone are the days of seafood gumbo, sausage or chicken gumbo. This hearty stew has all 3! Holy Trinity and then some. At one or more stages of this dish you may wonder if you are doing this right. Forge ahead. It’s going to turn out just fine. Heat the oil in a large dutch oven or pot on medium heat. 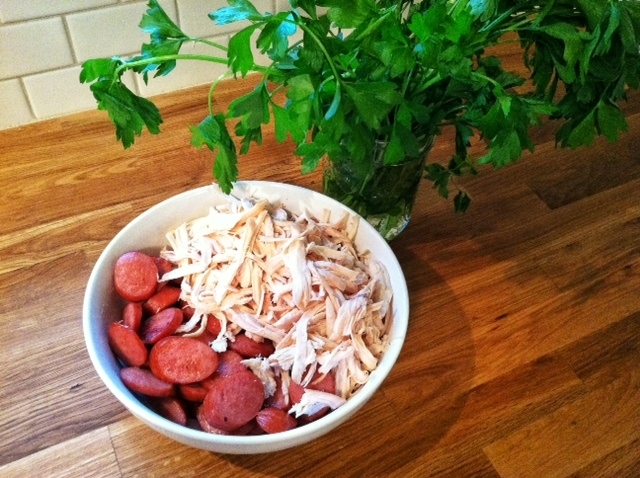 Add slices of sausage, cook until browned and remove. Sprinkle the flour over the oil, add 2 tablespoons of butter and cook over medium heat, stirring constantly, until brown, about 10 minutes. Let the roux cool. Turn the heat to medium low and melt the remaining 3 tablespoons of butter. Add onion, garlic, bell pepper and celery. Cook for 10 minutes. 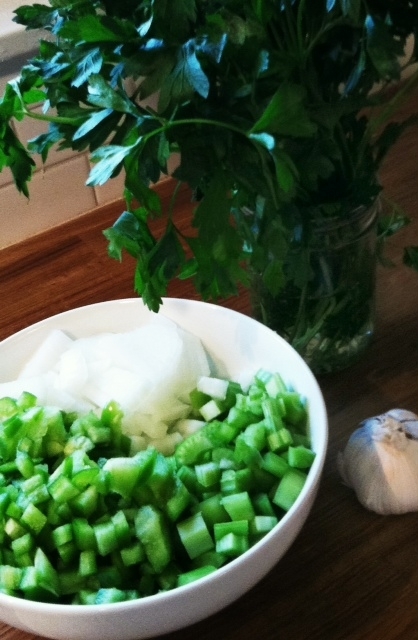 Add Worcestershire, salt and pepper to taste and half the parsley. Cook for 10 more minutes. Add the 4 cups of water and the bouillon cubes. Stir constantly. This is the step that will help break up the bits of goodness on the bottom of the pan. Add the pulled chicken and sausage to the pot. While stirring, bring to a boil and then reduce to a simmer. Cover and simmer for 45 minutes. Add the tomatoes, hot sauce and the okra. Stir, cover and simmer for 1 hour. 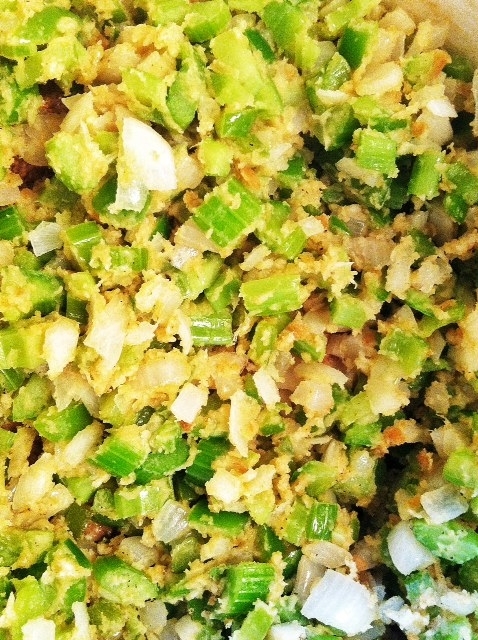 Just before serving, add the green onions, remaining parsley and shrimp. Simmer 5 minutes or until the shrimp are cooked through. Not even playin’, making this SOON! yumm-o! I am making this weekend! looks fantastic! One of my Sara favorites! I can’t wait to have Gumbo night! !